I am researching Henry Ford for this assignment. I need to find accurate, reliable resources and start reading. What information can I find using the online resources and the electronic catalog of materials available in the Media Center? 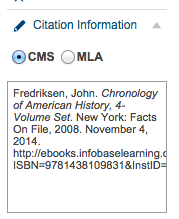 I need to make a list of all the resources I use, called a Bibliography, and these online sources make it really easy. What materials are available in the Media Center? Tip- I need historical events. Gale Virtual Reference Library, GVRL, is one of Huron's electronic Reference Collections. These are books that have been selected for high school classes. They are also very easy to add to my Bibliography. FRENCH, MICHAEL. "Ford, Henry." Encyclopedia of the Great Depression. Ed. Robert S. McElvaine. Vol. 1. New York: Macmillan Reference USA, 2004. 369-371. Gale Virtual Reference Library. Web. 3 Nov. 2014. Another one of Huron's electronic Reference Collections. Also, very easy to cite from the lefthand menu. Authoritative reference content alongside magazine and journal articles, primary sources, videos, audio podcasts, and images.